We go to extraordinary lengths, to bring you the most extraordinary lights. As the UK’s original Northern Lights holiday company, The Aurora Zone exists solely to maximise your chances of witnessing the spectacular Aurora Borealis. Experts in the Arctic, The Aurora Zone’s award-winning team are dedicated to helping you tick this incredible experience off your bucket list. 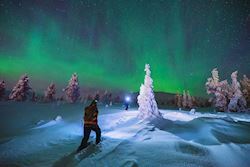 Using their unique Aurora hunting formula, years of experience, and well-established network of local partners, The Aurora Zone offers handpicked Northern Lights adventures designed to give you the very best chance of viewing nature’s greatest light show. 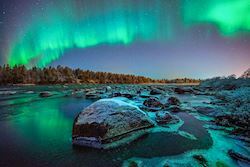 Running from September to late March, The Aurora Zone runs holidays to Finland, Sweden, Norway, Iceland, Canada, and Greenland with varied itineraries to suit all. 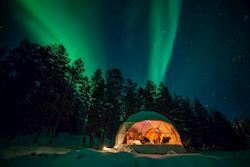 Whether you would like to experience snowmobiling, husky sledding, a reindeer safari, Aurora glamping, or simply want to enjoy these stunning parts of the world at your own pace - they have the holiday to inspire you. 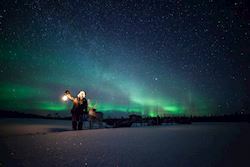 Their Aurora Experts have explored the heart of their handpicked destinations, met the passionate people on the ground, taken part in the experiences, and gazed in awe at the Northern Lights. Give them a call on 01670 336604 and let them know what would make your dream Northern Lights adventure, then sit back and relax as they create your perfect holiday. • Offer ends 14th April. • The discount varies depending on departure date. • For departures between 24/02/2019 and 30/03/2019 the saving is £170pp based on two people sharing. • For departures between 31/03/2019 and 14/04/2019 the saving is £130pp based on two people sharing. • Only one discount per person. • This offer is based on a booking for two people. • This offer must be claimed at the time of booking and not at a later date. • Applicable to flight inclusive bookings only. • Book any March 2019 departure date and receive a complimentary upgrade to a night in an Aurora Cabin and Ice Cabin (subject to availability). • Quote 'AURORA CABIN & ICE CABIN' when you book. • Please note this can be used in conjunction with our Ice Cabin Offer. • Valid on bookings until 24th March 2019. Let’s talk! Get in touch with The Aurora Zone today and speak to a trusted Aurora Expert.